What really scares me about ghostie horror stories is the element of the unknown. I mean, are there really such things as ghosts or evil spirits from the past? Or is it all just in my imagination? Actually, I think I can only tolerate the notion of ghosts at all by hanging on to the thought that there is no such thing, really. If the world were in fact thronged with ghosts and evil spirits, I'd be too scared to come out from under the covers, ever. So, what are harpies? And is Cassie right? Are the boys on her holiday island being seduced by harpies, disappearing, never to return? Its Greece. She's on a Greek island. Harpies are evil spirits from the ancient Greek myths, known to steal people and possessions away. 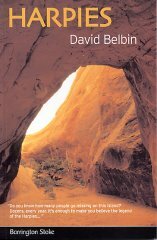 This is only a short novel, but David Belbin fills it full of atmosphere. He does that by asking a lot of questions about exactly what the characters are doing and not giving any answers. You know what it is like on holiday? Boys and girls make friendships quickly, they wander off together for a while, they may be quite serious about each other, or they may just be passing the time of day. It's not easy to keep tabs on people without being accused of being jealous or spiteful. That's Cassie's problem. And when she does finally raise the alarm, no-one wants to listen to her waffling on about harpies anyway. This is a short read. Don't think you are getting off lightly. It's quite disturbing, especially the end. Excellent!